The sun was just starting to peek up over the trees and the ruined dorms as she padded quietly toward the edge of the camp, beyond the tent with the animals and the building supplies. It was the first dry morning after a dry night, no hint of an oncoming storm. The chalk lines on the small pile of rocks were clear, coiling, slashing symbols that fairly pulsed with a power she didn’t quite understand. A few leaves were caught between the piled rocks. Herbs of some kind, though she couldn’t quite grasp what they were. The cross-shaped pile of rocks was caught inside of a small circle traced in the dirt around it, deep enough that the rain hadn’t washed it all away. She knew that Kellin came out every day, just before dusk, to check these and etch the lines deeper if she had to. She wasn’t sure what they were, but they were important to Kellin, and important to something else. That something else, though, there was the rub. The something else told her they were dangerous, unnatural. That they shouldn’t be there, that Kellin was doing wrong. While she found it hard to believe that Kellin would ever do something to hurt other living things, she’d watched the pain one of the something else suffered when it tried to touch one of these. There were seven of them, ringing the camp, most of them facing the ravine sides. They had to go away, but quietly. Kicking them over wouldn’t do. Kicking them over would just make Kellin put them back together again. That just wouldn’t do, not at all. No, she had to do little things. Things that wouldn’t be noticed right away. She crouched over the first of the tiny cairns, reaching into her pocket and taking out a few small leaves. 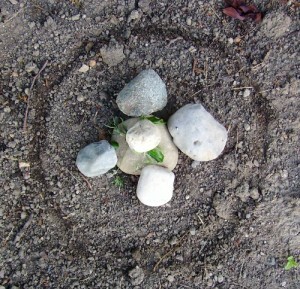 Carefully removing the original leaves from the cairn, she tucked these into its place, staring blankly at the stones. She licked her thumb and carefully erased a line on one of the lower stones. Straightening, she scuffed a toe lightly against the circle, just barely breaking it, small enough to maybe escape notice. The herb leaves looked the same as the ones she’d replaced. The chalk lines, to quick, casual inspection, looked the same as they had before. The circle appeared unbroken. She nodded slightly to herself. Indeed, child. That will do. Just that. It was smiling at her, and the smile sent shivers down her spine. You’ve done well today. Now keep doing it. She jerked and nodded, almost in a daze. The words echoed through her skull, shot more shivers down her spine, make her skin and scalp prickle with cold and power. It was unlike anything she’d ever felt before, and she didn’t feel like it was entirely unpleasant. She just nodded in response, then turned to go, promptly forgetting why she’d come out here in the first place. Then she looked down at the bucket sitting near her foot and remembered. Water. She’d come out for water. But why had she come this way? She sighed softly and picked up her bucket. Morning autopilot, probably, wandering half-asleep. It was still early, after all. She was silently grateful she hadn’t been on the watch today. That would have been awful. Walking around in a daze while she was supposed to be making sure nothing threatened them? That would certainly have been a complete disaster. Stasia waved to her on her way to tend to the horses. She smiled and waved back. She shook her head. “No, I’ll pass. I don’t think I can handle more corpses.” That first day had been bad enough. “You’re welcome!” The other woman disappeared into the tent, where the horses were stirring awake. She watched her go for a moment, then shook herself. Water. She needed to get the water, and then get back. There were things to do this morning. She started for the other end of camp. hah… cool beans covered in awesome sauce… a mystery insider working for the other team (teams?) and she doesnt even know it herself – this is getting v. interesting… Erin, keep it up please! I realize I’m a bit behind, but I do have a guess based off of just what I’ve read up to here. Carolyn. I was going to wait until I got caught up to say this, but I absolutely love this story so far. Keep up the good work. I skimmed back to this chapter to work out who this might be. A later scene suggests one character due to the similarity of their actions, but since that character is mentioned as a third party in the dialogue here, it can’t be her. The only female characters not mentioned in this segment by either the mystery person or Stasia would seem to be Jac, Carolyn and Leah. We don’t know alot about Leah, so I suppose it could be her, but for the same reason the dramatic impact would be much less that if it was one of the other two. Since Carolyn knows something about the supernatural world now and this character reads to me like someone who isn’t in on that side of things – at least, not knowingly – I’m going to sugegst Jacqueline and, if that’s the case, I forsee some terribly dramatic fallout for this in the future sometime, but, of course, I could be wrong. Just thought I’d record my theorising for posterity. It’ll be fun to look back on when I know more.